Once your order has been processed and confirmed your key code will come via email. Make sure you allow emails from pcwintech.com through your spam filter. CleanMem Mini Monitor is an add on that works with CleanMem, it doesn't replace CleanMem. CleanMem is still a set it and forget program and is totally free. 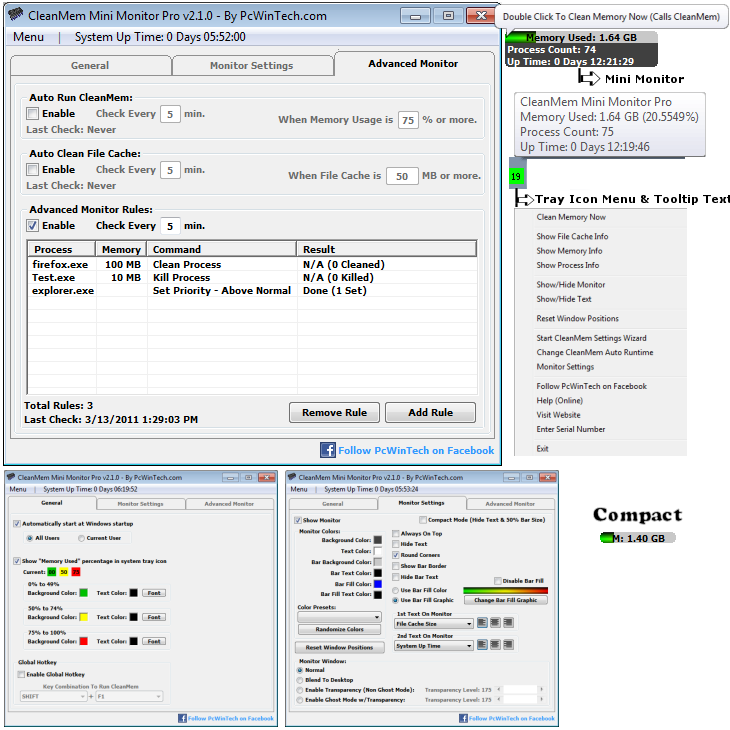 The CleanMem Mini Monitor is Free/Pro and gives users more options and greater control. CleanMem is a Free/Pro program. CleanMem itself is totally free. When you install CleanMem it will auto run every 15 min by the Windows Task Scheduler. Once installed it is set it and forget it. Just as it always has been. You can configure CleanMem to do more advanced things such as ignore lists, only lists, and log files. These can be set by the CleanMem Settings program in the start menu. The Mini Monitor is the only part of CleanMem that is the Free/Pro. All features in the mini monitor from v1.7.0 are included and still free, including some new features that where added as well. The Pro version of the mini monitor is simply extra features, such as tools and information. One very important thing is that there are no nag screens in the free version of the mini monitor and no pop ups asking you to upgrade to pro or anything like that. So the free version is still as helpful as it was before and the pro version adds more control and options for the power users. Much more detailed information about CleanMem can be found here. What is MD5 hash? MD5 hash is a code made from every byte of the file, if the file is different in any way the md5 hash will change.